While such titles might not get him on the NY Times best-seller list, Cho is widely respected, UNIST reporting he has been named to the 2017 Highly Cited Researchers List in materials science, a second such honor for him. Professor Cho’s paper (in full) describes the aluminum flow battery he and his team developed. According to the UNIST News Center, “…Compared to the existing lithium-ion batteries (LIBs), the new battery outperforms the others in terms of higher energy density, lower cost, longer cycle life, and higher safety. One drawback – the battery is a primary storage device, meaning it cannot be recharged. It can be readily swapped out of its host vehicle, though. An Israeli firm, Phinergy, promotes its aluminum-air battery as delivering eight kilowatt-hours per kilogram, capable of driving a small car 1,000 kilometers (620 miles) and being recharged in three minutes. Comparisons are difficult since Phinergy does not have hard data on its web site. Earlier reports show that Eviation showed interest in powering its aircraft with Phinergy cells, though. “EViation says that the battery is ‘coupled with a high power rechargeable battery buffer, and managed by a clever mission specific power analytic algorithm. This unique technology provides high energy density ‘at a cost that beats gas, and with zero emissions.’” Little new has been heard from the battery company until this last February, when it formed a joint venture with China’s Yunnan Aluminum. The combined company, Yunnan Phinergy Chuang Neng Metal Air Battery Co Ltd, will have a registered capital of 813.82 million yuan ($128.97 million). 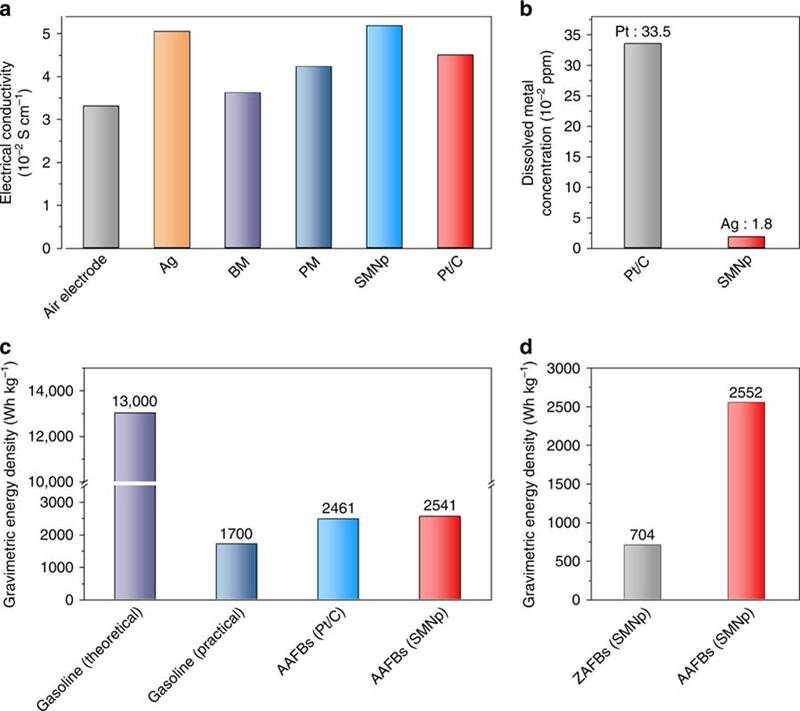 Aluminum batteries using “traditional” electrolytes faced problems with high anode costs and difficulties removing byproducts when they were discharged. Professor Cho and his team developed a flow-based aluminum-air battery to continuously circulate the electrolytes, solving these issues. The battery and its electrolytes are also fire and explosion proof. 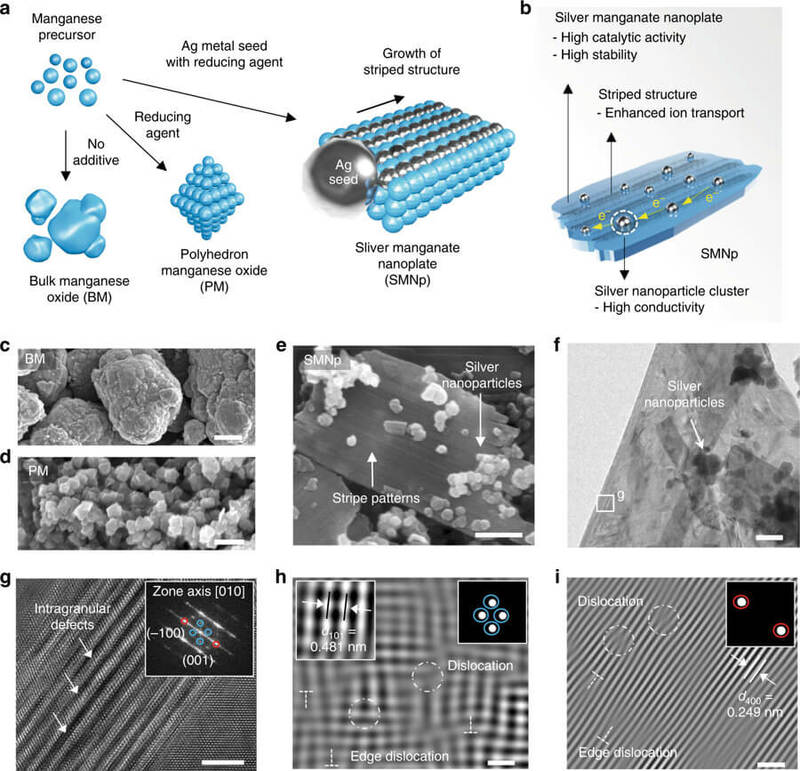 Their silver nanoparticle seed-mediated silver manganate nanoplate architecture for the oxygen reduction reaction (ORR allows silver atoms to migrate into the available crystal lattice and rearrange the manganese oxide structure, thus creating abundant surface dislocations. One aspect of the study deserves more attention, in your editor’s opinion. The definition of energy density for “gasoline (practical)” could use a layman’s explanation. 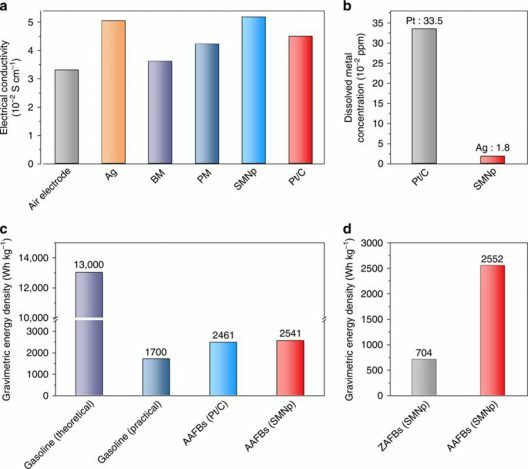 We know that batteries traditionally have had lower energy densities than gasoline or other fossil fuels, but made up for that by the fact that internal combustion engines use only a quarter to a third of that energy in useful work, the rest consumed by heat exchanges and mechanical inefficiencies. 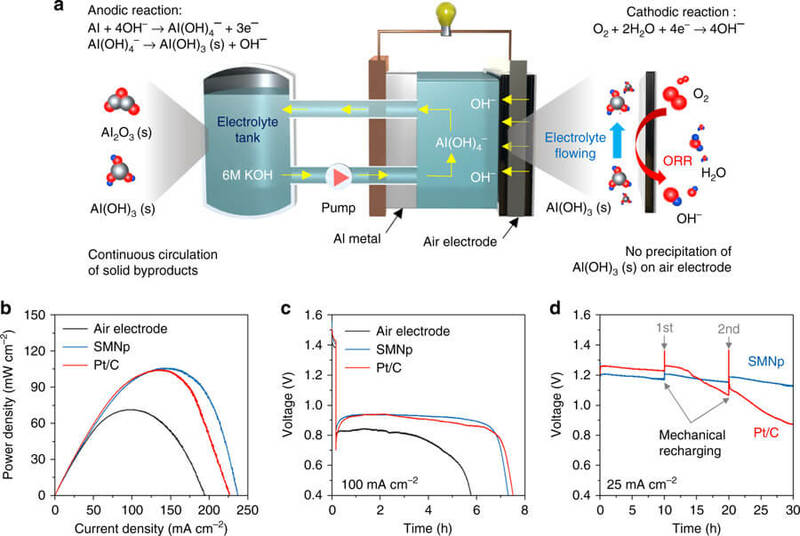 Cho’s work here puts his battery at a level with or superior to gasoline in practical terms. For a discussion of the practical limits and applications of battery energy densities, see this discussion from GreenTransportation.info. Your editor found their motto, “Why and how to joyfully move our butts around town, without mucking the place up,” to his liking.